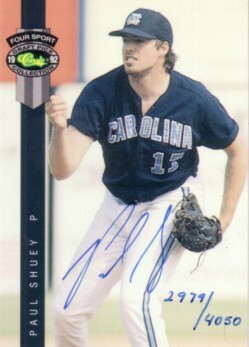 1992 Classic Four Sport certified autograph card of former North Carolina star pitcher Paul Shuey, who went on to pitch 11 seasons in the majors, mostly with the Cleveland Indians. Numbered out of 4050 produced. NrMt-Mt or better. ONLY ONE AVAILABLE FOR SALE.